Recently I've been giving beauty subscription boxes a second chance. While I've given Nailbox, Glossybox and Birchbox a go, one I hadn't tried before was the Look Fantastic Beauty Box. With the September edition being it's 1st Birthday I thought there was no time like the present to give it a go. The difference between the Look Fantastic Beauty Box compared to the rest is that there's actually no subscription involved. You can simply purchase the box before or after the contents have been shown so there's much less risk of disappointment involved. 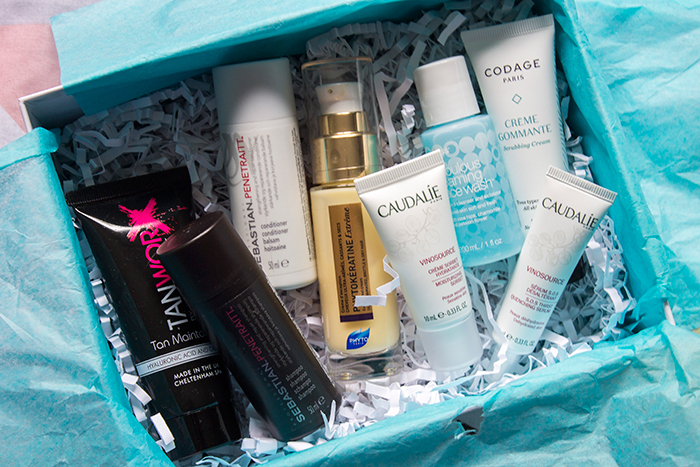 As it's the birthday edition, this box is filled with 8 samples to choose from. First up is the Bliss Fabulous Foaming Face Wash which sadly was a disappointment to see. Having sensitive, acne prone skin I had to rule out all foaming face products so I can't even use it! This one will be passed onto loved ones or perhaps used as a brush cleanser. After a bad start, another one was thrown into the mix with the Tanworx Tan Maintainer, which as a tanning virgin I have pretty much no use for. Having said that, it does smell pretty nice and left my skin feeling soft and hydrated so maybe I could use it as a general body moisturiser. Hoping the next product to be a success, the Sebastian Penetraitt Shampoo & Conditioner was a welcomed addition. Finally something I can use! The formula itself is pretty thick but easy to wash out of the hair, though with these samples I could probably only get around 3-4 uses out of them. My hair was left feeling strong and nourished, nothing groundbreaking but a decent shampoo and conditioner. My favourite product out of the whole box has to be the Phyto Phytokeratine Extreme Exceptional Cream. Lisa has been a long time fan of Phyto products so I had high expectations. This stuff is great for popping onto dry hair in need of some quick hydration. For someone with greasy prone hair, the thought of applying products after blow drying made me nervous but this stuff is fool proof, great sample size too. I love a good serum so I popped on the Caudalie Vinosource S.O.S Thirst Quenching Serum straight away. It's an extremely light, watery formula which sinks into the skin instantly. It's a really nice step before moisturiser to add a little extra hydration to the skin. Also from the same brand, the Caudalie Vinosource Moisturising Sorbet was included to be the step after using the serum. This one is a little thicker and said to be for sensitive skin, however I found it a little irritating after a while. Not sure this one's for me. I've been all about the exfoliators lately so I was glad to see the Codage Scrubbing Cream in this months box. It's a very fine, grainy exfoliator which left my skin feeling so smooth. I find it a little harsh for regular use but every now and then I'll be popping it on for a treat. Overall while I was impressed by the amount of samples, I don't think this months box was for me. I would have liked to have seen an equal number of makeup and skincare samples to add a little variety. If I were to pick up a box in the future, I think it would be best to wait and see what's in the box before purchasing.